Photography: Pics by Maxime Cassagne. Thomas Noyer dropped a bomb entry for BITR! We caught up with the man to discuss his entry, and what we can expect from him at the main event, read on! Firstly, congratulations on winning one of the flights to Colorado for the Battle in the Rockies. What was your initial reaction to the news? Thanks E! First, I have been very honored to have been invited to submit an edit for this contest! My initial reaction by reading the results was I didn’t believe it! By browsing the rider list, I thought it was not possible. Then, I was and I’m still very happy for having been picked!! I’ve never been to the U.S, so it was a pretty good news!! How much work went into your entry? At the beginning I wanted to pull two medium combo back to back. But, when I watched the amazing Shintaro’s entry just two day after the contest began, and how he put the level high, I thought I had to film a one minute long combo to put all the chances on my side. I started to practice tricks one by one in different order and in various combos. When I thought I’d be quite consistent, I tried to combine them in one combo. I spent severals hours practicing it before to pull it. Very often, I failed during one of the last trick (tired and lack of clarity..).So, I realised how much it would be hard and mental to pull a 3 min combo as Moto and Dom did: what an amazing physical and mental performance! If you had to pick one other entry besides yours, who would you have picked and why? I think all the riders who came in this BITR video contest were very involved!! There were some amazing entry which highlighting the tricks (often never seen before!) and the style of each rider. I watched them so many times! So close to choose one among Moto, Hiro, Dub, Shintaro or Dez because they all put their own difficult tricks and proper style in their edit, furthermore in a one minute long combo…. 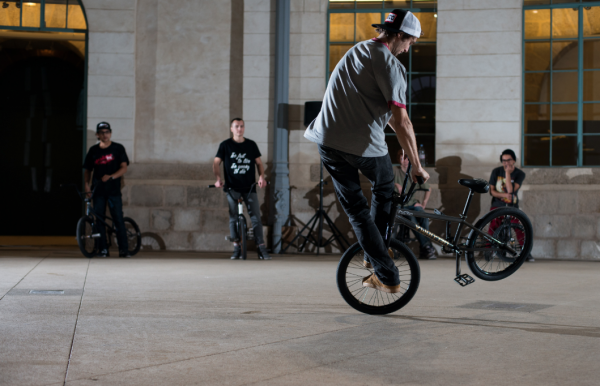 The video contest seems the most cost effective way to involve riders across the globe in a contest, do you see this type of event growing in flatland? Sure, because this kind of process is a pretty good way to push the rider themselves and those who just watched the edits to progress or just to start flatland. Each one, with his level, wins! This kind of event as the previous ones (ground tactics, GF battles…) democratizes flatland and allows to discover some amazing talents! It’s not easy to travel the world without a big sponsor and a full time job… And there, reward was worth it!! 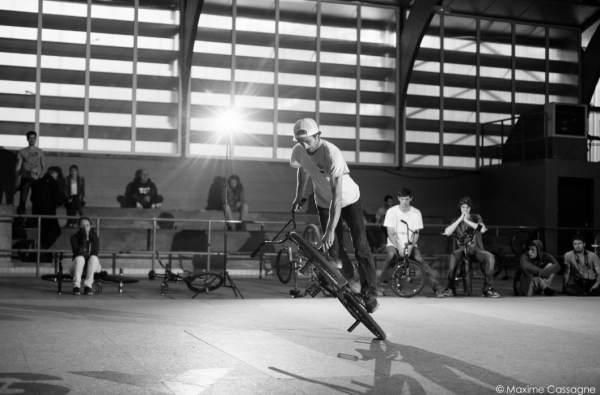 I even read a comment suggesting to put together some real video contest with prices money… But it never replace the meeting with the riders, the live sessions, and all the moments of sharing which is a really important aspect of flatland.. Were you harder on yourself composing a video combo entry than you might be for a live contest entry? I was and I’m still certainly harder on myself composing a video combo! No pressure of time, of crowd, ground and place i use to ride on almost everyday… No excuse when your are on your own spot! I think contest video put each rider in his theoric best conditions to give his best riding… So I was determinated to do what I had decided: some of my last original tricks or switch combine between them in one combo. From here, most important was to pull the combo, not the result…even if today I’m stoked for having got the flight! It was a really nice experience of riding to guide it on consistance aspect with ideal target to ride in live as in video… But not yet!! What can we expect from you in Colorado? To spend some great time on and besides the bike, to meet some cool people, visit some amazing place and enjoy the whole trip. I’m gonna try to go to Colorado with a good mood, telling myself I already won a great thing: to be able to come in! I would like to thank my family and my girlfriend who always supported me, James McGraw for having the idea and involvement of organized this video contest and Flatmatters for giving me the chance to explain my process. I also would thank my sponsors: ESPRITbmx & Equilibre flatland parts, DECOBmx and Chad DeGroot for keeping my bike fresh, Xplicitenergy drink and Lockwood skateshop and Maxime Cassagne for the nice pics. I say hello to the whole ROOTS bmx asso crew in Albi and to all the rider i rode and i will ride with! Cheers! This entry was posted in Contest edits, Exclusives, Interviews, News and tagged Thomas Noyer - Battle in the Rockies Interview by Effraim. Bookmark the permalink. Dope read! Do enjoy when Effraim does these interviews, thanks! Curious, the three riders that are going to bitr have all been interviewed, but might we be seeing an interview from Cory? EEEEEBBBBBBBEERRRRRRFFFFFTIIIIIIZZZZZZIIIIIIINNNNNEEEN !!!!!!!!!!! ONE FOOT SIDE PACK -HALF BAR TO SIDE PACK !!!!!!!!!!!!!!!!!!! TURBINE TWO FOOT YARD -BODY VARIAL TO CROSS LEFT INSIDE SEATLESS STEAM !!!!!!!!!!!!!!!!!!!! ROLLING RANGS AND MESSIAH RANGS TO PEDAL FIVES !!!!!!!!!!!!!!! SPINNING -REG K TO SMOOOOOOOOOOTH SPINNING BACKWARDS SIDE PACKER !!!!!!!!!!!!!!!! NOT TO MENTION THAT PEDAL FIVE CROSS- RIGHT / LASH , DIRECTLY TO PEDAL FIVE AGAIN / STRAIGHT TO FIRE HAULS DIRECTLY TO SPINNING CLIFF TO END OF !!!!!!!!!!!!!!!!!! WHHHHHHOOOOOOOOOOOOOOSHHHHHHHHHHHHHHHHHHHH !!!!!!!!!!!!!!!!!! MAMMOTH OF A COMBO !!!!!!!!!!!!!!!!!!!! ALERT !!!!!! ALERT !!!!!!!!! I PRAY THAT ANYONE PUT UP THE WHOLE BATTE OF THE ROCKIES COMP LIVESTREAM !!!!!!!!!!!!!!!! JAMES MGRAW IS THE SEEEEEEEZZZZZZZZZZZ MAKING THIS HAPPEN !!!!!!!!!!!!! RAD COMBO MR. NOYER !!!!!!!!!!!!!!! !